The GUI was improved to reflect more elements of the syntax highlighting (Active Line, Enabled break point, Disabled break point, execution point, error line), also when you click in any place in the editor the associated element is shown in the selection list. 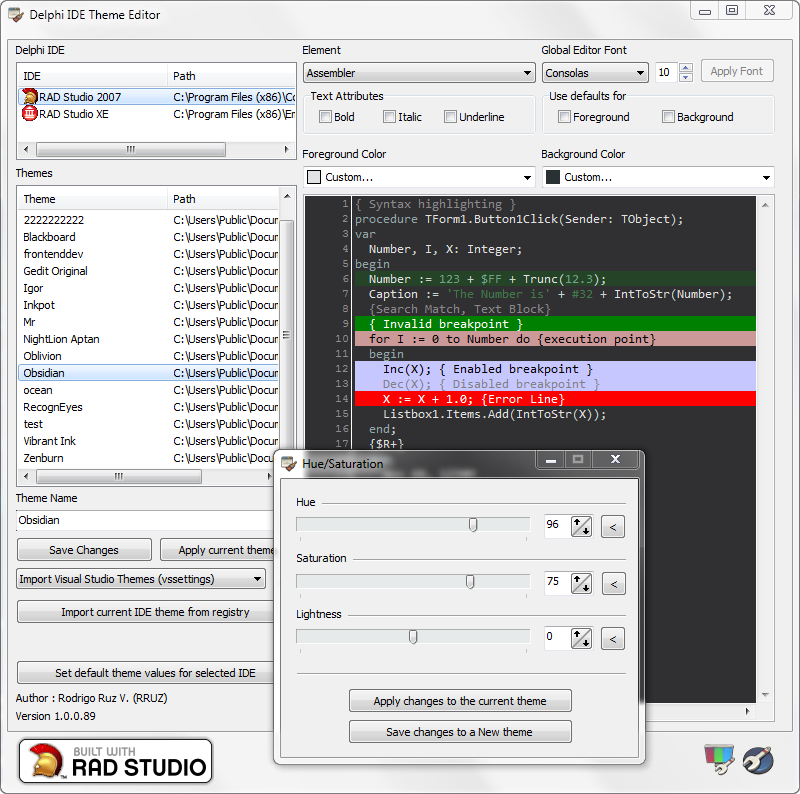 More Themes added, now you have 50+ themes to personalize you Delphi IDE. 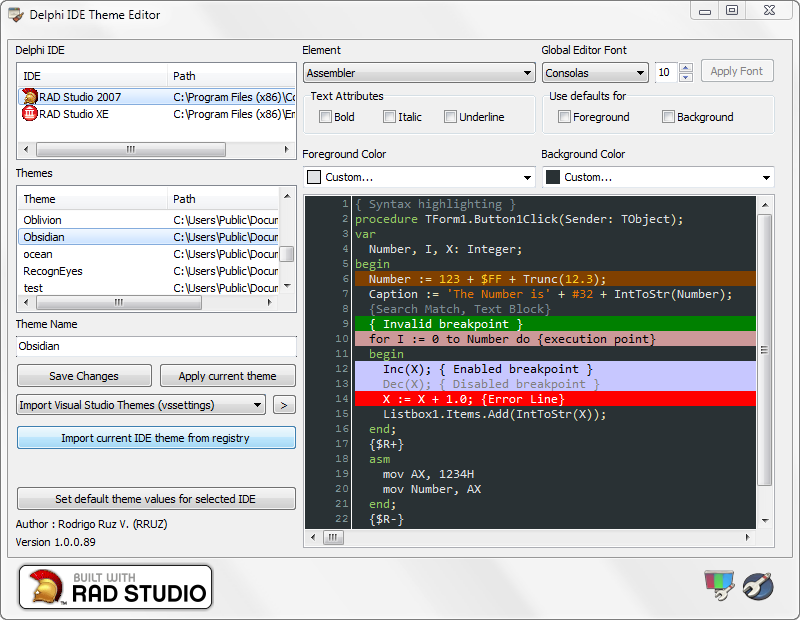 Finally an new page was created on my blog to publish the last news and features added to the Delphi IDE Theme Editor. And remember your suggestions and comments are very important to improve the application. Outstanding work. You had me won over with the first version. Thank you for this tool. Awesome work! Thanks so much for this! IDK if I was clear… When i mentioned Delphi IDE windows, I was talking about it *in* your application. Hope you understood. Another thing that could be added to it is a Closed Region (or like Delphi colors scheme names it: “Folded Code”). Thanks again for you feedback, but for clarify the application uses a standard Unicode synedit component, so to implement code folding in this component i need to write a lot of code. I don’t know if do this worth the effort, because is only to show the code folding syntax in the app. i prefer focus in the stability and additional features like support more themes from others IDE’s. I thought if theres a way that you could just show the color when the code is folded. Indeed, when the code is unfolded, the color is already shown. So a static Text with a color markup to show the color of folded code would be great. Got it? Great work. This version is even better. For me, a still missing feature is a “Save As” option from the main form to create a new theme based on an existing one without altering the existing one. It seems this can be accomplished from the new “Hue/Saturation” dialogue, but it’s an extra “hidden” step.